Your furnace and air conditioner work hard to keep your family comfortable. In fact, an average home’s heating & cooling system runs over 2,000* hours every year. That would be like driving your car at 65 miles per hour, non-stop, for 130,000 miles. You wouldn’t run your car that long without a tune-up, and you certainly wouldn’t want to let your home’s heating and cooling system go that long without maintenance, either. Dust and dirt in the air accumulate in your home’s heating and cooling system, and over time that can make your system less efficient and less reliable. All of that can cost you – in higher energy bills as well as unexpected repairs. Your heating and cooling system uses a lot of energy, as much as half the energy in your home. It only makes sense that making smart choices regarding your heating, ventilating, and air conditioning (HVAC) system can have big energy-saving dividends. The first reason for maintaining your heating and cooling system is to make sure it’s performing efficiently, which has a direct impact on your monthly heating and cooling costs. Just like your car, your home’s heating and cooling system needs regular service to keep in running order. When you update the thermostat setting, you expect the system to deliver the desired temperature. However, if the system is hampered by a lack of maintenance it could be working too hard, unable to reach a comfortable temperature. 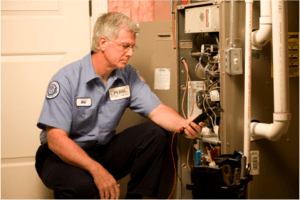 Some people seem to think that regular maintenance on their HVAC system will be costly, so they put off calling a service company until trouble strikes: a winter morning with no furnace or a hot summer day with no AC. At that point, they’re faced with a big repair bill and, often, a backlog of service calls that means the system won’t be running again for several days. Regular maintenance not only saves money, but it also avoids the headaches and hassle of an uncomfortable home. Some homeowners may be unaware of this, but most manufacturers require routine maintenance to keep the warranty valid. Without it, you could find that a relatively new system is expensive to fix when something does go wrong. Resistance and friction can cause parts to wear out quickly and lead the system as a whole to use more energy. This is why your yearly inspection includes lubrication of all the moving parts in your system. Properly maintaining your system can add as many as 3-5 years to the working life of your heating and air conditioning system. Not only that, it can help the system resist the loss of efficiency as it ages. Inspecting, cleaning, and adjusting blower components is also important. This helps to make sure the air is flowing properly in your system. As a matter of fact, problems with air flow can reduce your system’s efficiency by as much as 15%. * Average usage/year = 6 hours/day x 7 day/week x 4 weeks/month x 12 months = 2016 hours/year. Don’t put it off another day. Schedule maintenance service online now or call us at 732-733-2548.